Mariano Rivera was officially credited with a hold Tuesday, but I give him a save. As in, he saved the All-Star Game from being a real dud. *As an aside, Harvey and the Jimmy Fallon folks owe a nod to the Seahawks Richard Sherman for Harvey’s amusing segment on Monday in which he interviewed unsuspecting folks about Matt Harvey. The conceit, of course, is that they are unaware that Harvey himself is holding the microphone – a concept pulled off beautifully, months ago, by Sherman during the Super Bowl. That said, it sure helps matters when the game itself is compelling. This one really wasn’t. Until Rivera’s memorable entrance in the eighth inning, there were just a few moments that stood out, and none that will be remembered much longer than the re-start of play on Friday*. *Aside No. 2: I am now in favor of a slight restructuring of the All-Star schedule. This year, all teams are resuming play on Friday instead of the normal Thursday. That leaves the baseball stage pretty much dark for two days (unless you’re a big fan of the Triple-A All-Star Game tonight). Addressing the Baseball Writers Association of America meeting on Tuesday, Bud Selig was asked about moving the All-Star Game to Wednesday so that all the Sunday pitchers shut out of All-Star Game action could appear in the game. Selig downplayed the possibility, but it seems to me that MLB is diminishing its All-Star Game when numerous aces can’t throw in one of its showcase events. The list this year included Hisashi Iwakuma and Justin Verlander, while last year it was Felix Hernandez, among many others. This is not my idea, but I endorse it: Why not have the Futures Game on Monday, the Home Run Derby on Tuesday, and the All-Star Game on Wednesday? That would help give the Futures Game a more prominent showcase. It would still allow the highly rated Home Run Derby its spotlight. And then all the best pitchers would be available for the All-Star Game. MLB would have only one day, Thursday, without any exposure, and the length of the All-Star break wouldn’t be affected at all, except for the All-Stars themselves, who could deal with it, I’m sure. Manny Machado’s great play to rob Paul Goldschmidt. I think the immediate reaction was a bit overheated, perhaps because there hadn’t been anything else to latch onto. It was a very good play, but hardly Brooks Robinson personified. Nor even the best of Machado in the last week. But the seemingly effortless way he handled a tricky hop to his backhand, and gunned down Goldschmidt with the long throw, highlighted what a brilliant player this 20-year-old is. The future of the game is in good hands with Machado, Bryce Harper, Mike Trout and Jose Fernandez, all 21 or under, and other young stars like Harvey. My favorite non-Rivera moment was Prince Fielder’s triple in the ninth inning. Admit it – it’s always a kick to see the big guys lumbering around the bases. Only Fielder doesn’t lumber – he motors amazingly fast for a 280-pounder. When the ball scooted by the diving right-fielder, and Fielder turned on the jets as he neared first base, it was amazing to see his athleticism in action, capped by a thunderous dive into the bag. One final word about the Rivera introduction. Initially, I thought Jim Leyland had blown it by not saving Rivera for the ninth inning. 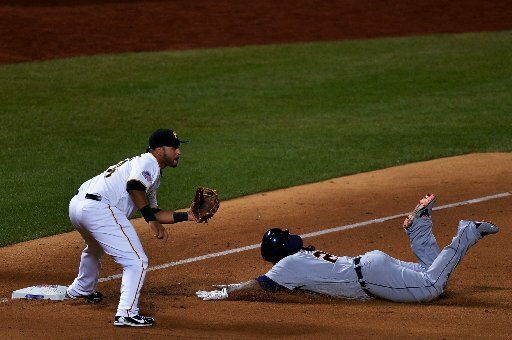 The AL had a 3-0 lead, and the most fitting All-Star conclusion for Rivera obviously would have been a save. But the more I thought about it, the more I realized that Leyland did the exact right thing. He simply couldn’t take the chance that his relievers would blow the lead in the eighth. Can you imagine the embarrassment to baseball if the game had ended with Rivera never getting a sniff of the mound? It would have equaled the infamous tie in 2002. The only way to ensure the grandeur of Rivera’s entrance to an empty field was to have him come in at the beginning of an inning, and the only way to ensure he got that chance to do it was to have him come in in the eighth. So Rivera got a hold, and not a save. The emotion surrounding his entrance, and reception, elevated this previously dull game to one that will always be remembered. And that’s a pretty nifty save, even for a guy who has more than 600 of them.